Every week, it seems there’s another tragic story about a suicide or murder-suicides linked to foreclosure trauma. 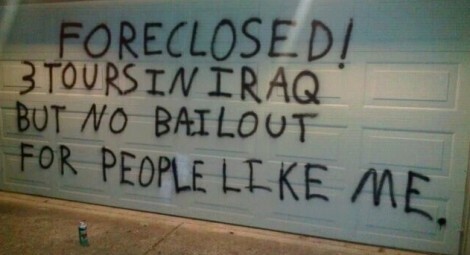 Some of the more spectacular murder-by-foreclosure stories the past few years have been collected by a blog called “Greenspan’s Body Count” others, myself included, have been writing about these terrible stories of class warfare being waged by the only side fighting it, and winning it, as Warren Buffett rightly said. Before the 2008 crisis, the media paid little attention to the death toll taken on Americans by the decades-long class warfare waged against the 99%. Now they’re impossible to ignore. Stories like the US soldier in Iraq who committed suicide so that his wife could collect life insurance, and save their family home from foreclosure. Or the courtroom-suicide in Phoenix, in which a Yale-educated banker-swindler swallowed a cyanide capsule after being found guilty of setting his 10,000 sq foot McMansion on fire as a way of collecting insurance and evading mortgage payments he couldn’t afford. Despite the somewhat increased media attention given to these tragic stories nowadays, there is one suicide directly tied to foreclosure fraud that has been completely ignored by the media. Her name was Tracy Lawrence, and for a brief moment last year, between the moment she turned whistleblower and her untimely and bizarre suicide, Tracy Lawrence’s testimony threatened to blow the entire fraud-closure criminal enterprise wide open, with repercussions that could have easily reverberated all the way up to the major banks and GSEs complicit in one of the greatest crimes this country has ever experienced. In the months since Tracy Lawrence was found dead in her Las Vegas apartment at the age of 43, her story has only taken on more significance ~ even as her death has been forgotten. This is a story that demands our attention, a story we must not allow ourselves to forget. Foreclosure fraud had been devastating America unabated for a few years, laying waste to untold hundreds of thousands of American families. The Nevada attorney general’s criminal case against the two LPS title officers ~ Gary Trafford and Geraldine Sheppard ~ represented, for a brief moment, the first time in years that American justice threatened the predatory lending class. WHAT HAPPENED TO THE BOMBSHELL INDICTMENT OF THESE LPS SUPERVISORS? This marked the first time that big time bank fraudsters faced serious jail time ~ Attorney General Masto’s criminal case sent shockwaves throughout the mortgage lending world. More importantly, her criminal case threatened to finally change the way America deals with the bankster class that has been plundering with impunity for years. Politically, Nevada’s criminal indictment could have enormous repercussions; economically, the case could lead to invalidating tens upon tens of thousands of fraudulent foreclosures conducted in the Las Vegas area over the past few years. In what appear to be the first criminal charges to stem from the fracas over improper foreclosures last year, two Southern California title loan officers have been indicted by a Nevada grand jury for allegedly filing tens of thousands of improper documents related to Las Vegas-area foreclosures. The Clark County grand jury charged Gary Trafford, 49, of Irvine and Geraldine Sheppard, 62, of Santa Ana on 606 counts, alleging that the two headed up a vast “robo-signing” operation that resulted in the filing of tens of thousands of fraudulent foreclosure documents. Just a few months after the Nevada AG’s 606-count criminal indictment against LPS, Missouri’s attorney general filed a 136-count criminal indictment against a unit of Lender Processing Services, called Docx, as the New York Times reported last February. That meant two major criminal cases. One of the rare exceptions was the excellent reporting done on my friend Dylan Ratigan’s Show, as well as the unforgettable 60 Minutes segment aired last year on foreclosure fraud and “robo-signing” mills. The 60 Minutes investigation focused on the fraud perpetrated by Lender Processing Services unit, Docx, which used blatantly fraudulent “robo-signing” foreclosure documents to dispossess Americans of their homes on behalf of the Wall Street banks. Like the way peasants in a banana republic are treated, hundreds of thousands ~ if not millions ~ of Americans have been illegally and fraudulently evicted from their homes. And all the while as it happened, the Obama Administration stood by and wrung its hands ~ and that’s the kind, whitewashed way of putting it. 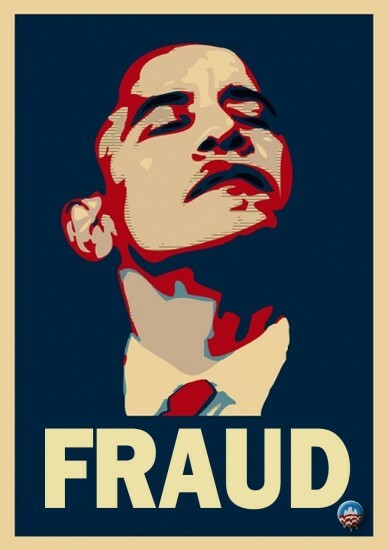 Another way of looking at what the Obama Administration did with the mass foreclosure fraud crime ~ the true and honest way of putting it ~ is that the White House actively provided political and legal cover for one of the largest crimes perpetrated against Americans in modern history. Sorry, but that’s the truth ~ and the sad thing is, as horrible as the Obama Administration has been on housing, a President Romney will almost certainly find a way to be even worse, even if that worseness has to be invented. That’s one of the lessons we’ve all had to learn these past few decades. 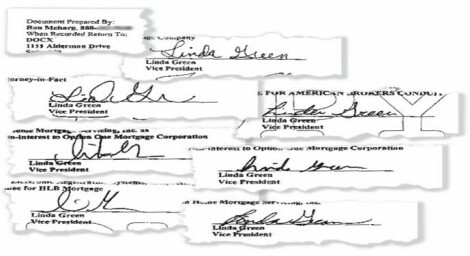 The 60 Minutes segment zeroed in on what is now the most infamous fraudulent-signature of our time: The infamous “Linda Green”—whose signature appeared on an impossibly large number of foreclosure documents. 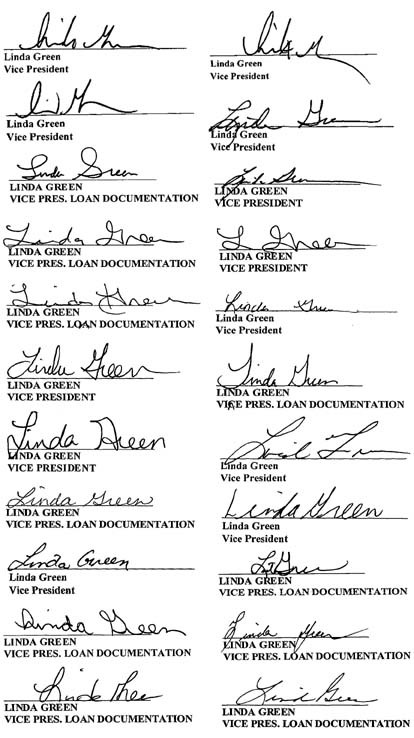 A single fake “Linda Green” was officially listed as a “vice president” at some 20 different foreclosure mills, this same “Linda Green” signing untold thousands of fraudulent documents evicting Americans from their homes. Among the worst of the foreclosure servicers abusing the fraudulent “Linda Green” signature was Docx, the unit of Lender Processing Services which has since been shuttered. We went searching for “the” Linda Green and found her in rural Georgia. She told us she has never been a bank vice president. So you have now a sense of just how vast the foreclosure fraud crime was, and how it involved not only the largest mortgage servicer in the nation, LPS, but also all the major banks that used LPS’s services to throw Americans out of their homes illegally and take possession of them. No fraud here folks, looks like 1 authentic “Linda Green” to us! Let’s rewind again to last November 16, 2011, the day that Nevada’s attorney general Masto announced her indictment against the two LPS title officers ~ two weeks before Tracy Lawrence took her life. Nevada’s case against LPS rested primarily on the testimony of a whistleblower, Tracy Lawrence, who worked in Lender Processing Services’ office in Las Vegas. Her testimony threatened to unravel tens of thousands of fraudulent foreclosures in the state of Nevada between the years 2005-2008, and the criminal activities of the entire mortgage servicing industry. Nevada has suffered the worst foreclosure problem of any state in the union. In return for turning state’s witness, Tracy Lawrence plea bargained her charges down to a single misdemeanor charge of falsely notarizing a signature, which carries, in the worst case scenario, a maximum of one year in prison and a $2,000 fine. However, her testimony could put her two LPS superiors behind bars for decades ~ which is why many believed Nevada’s goal was to turn those two LPS officers into state’s witnesses against LPS’s senior executives. On November 29, 2011 ~ just two weeks after the Nevada attorney general announced the landmark criminal case ~ whistleblower Tracy Lawrence was supposed to appear before a judge for her sentencing. It should have been a routine appearance, but she didn’t show up. Her lawyer grew anxious, called police to check on Tracy Lawrence’s home, and that’s when they found her dead. The timing of her death was suspicious, to say the least. Immediately, before any investigation had been conducted, Las Vegas police officially “ruled out homicide” as her cause of death. It could not immediately be determined whether Lawrence, who faced up to one year in jail and a fine of up to $2,000, died of suicide or of natural causes, KSNV reported. Detectives said they had ruled out homicide. 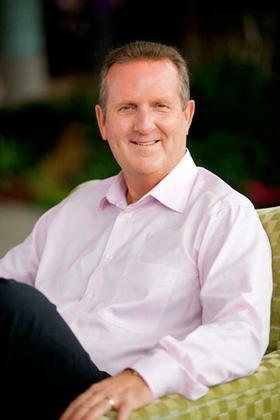 Lawrence came forward earlier this month and blew the whistle on the operation, in which title officers Gary Trafford, 49, of Irvine, Calif., and Geraldine Sheppard, 62, of Santa Ana, Calif. ~ who worked for a Florida processing company used by most major banks to process repossessions ~ allegedly forged signatures on tens of thousands of default notices from 2005 to 2008. ED: It’s a good thing there's no motive to make a detective suspicious here or anything! I recently called the Clark County coroner’s office to find out if they had determined her official cause of death. A spokesperson told me that Tracy died from “intoxication” of a combination of Xanax (Alprazolam) and two antihistamines: Benadryl (Diphenhydramine) and Hydroxyzine. Officially, her death was ruled a suicide. Though there has been little public discussion about Tracy Lawrence’s suicide, in private forums, her death sent a chill. Although there have been reports that Lawrence was depressed and stressed from her role as the key whistleblower, no one I know who reports on the housing disaster unquestioningly accepts the official version, that Tracy Lawrence’s suicide timing just happened to come at the most convenient time imaginable. I bet Linda Green signs the coroner’s report…. One only has to remember that Las Vegas’ gambling industry was created by mobsters like Meyer Lansky ~ who is also credited with helping invent modern offshore banking in the early 1930s in Switzerland. In this world, deaths ruled “suicides” are not unheard of. One of the most spectacular examples involved the “suicide” of Roberto Calvi, chairman of Italy’s largest private bank, who in 1982 was found hanging from London’s Blackfriars Bridge with bricks stuffed into his pockets along with $15,000 cash. The day before Calvi’s “suicide” his secretary “jumped” out of the bank headquarters’ fourth floor window and died ~ her death was also ruled suicide. It took over two decades for authorities to overturn the “suicide” verdict and state the obvious: In 2003, Italian authorities ruled Roberto Calvi’s death a murder. In the meantime, the fallout from Tracy Lawrence’s suicide has been worse than predictable: In Nevada, the case against Lender Processing Services appears to have all but fallen apart. With the Obama Administration foisting its foreclosure fraud settlement on all the states in January ~ a deal that left bankers happy, and everyone else screwed ~ and the key witness to the LPS case dead, the writing was on the wall. Along with Kelleher, several other Nevada prosecutors and investigators have since been reassigned or transferred out to pasture. In the courts, a Nevada judge all but gutted the AG’s criminal case against Lender Processing Servicers. Over in Missouri, the state’s criminal case was recently quietly settled for a paltry sum, and forgotten about. Meanwhile in LPS’s headquarter state of Florida, the attorney general Pam Bondi has done everything to protect LPS, even firing two of her office’s attorneys who made the mistake of investigating LPS fraud. “First, let me just say we are very pleased to report strong second-quarter operating performance…we’ve gained greater clarity over the potential resolution of legal and regulatory issues related to the past practices. So Tracy Lawrence’s highly suspect suicide is another major victory for the bankster class, and another giant loss for the rest of us. No matter what the circumstances of her suicide ~ that is, even if she was driven to kill herself in despair, after turning whistleblower and facing the pressure of confronting one of the biggest criminal fraud scams in history ~ that doesn’t make her death any less significant, or infuriating, or disturbing. Either way, the criminal lending industry drove a lone and lonely hero to her death. All we can for now ~ while this country is still controlled by a rank oligarchy ~ is remember Tracy Lawrence’s suicide, so that some day we can learn what drove this hero to her terrifying early grave.